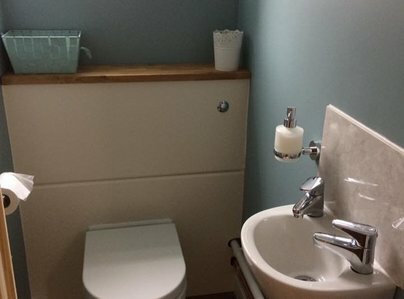 We are a central heating and plumbing company based in Bath. We have been in operation as a family run business for over 35 years. We take the time to use our extensive experience to provide you with the best and most efficient system your budget will allow whether a manor house or tiny flat and we will do our best to tailor to your needs. We are both Worcester and Vaillant approved boiler installers which means we can offer extended guarantees on their boiler ranges. We are the type of firm that likes to build a relationship with its customers, some of whom have been with us for many years. This relationship being based on trust, that we will do our best to undertake the work at a reasonable and competitive price. We would like you to know that we intend to be on the other end of the phone/computer for at least the next 35 years! In November 2018 I contacted RJ Mitchell & Son for a quote to replace my boiler. John arrived promptly and conducted a thorough investigation of what was required. He was very knowledgeable and offered a couple of solutions. I received a very reasonable quote by email shortly afterwards. The work was agreed to commence in February and we communicated by email to agree a mutually convenient date. John and his team arrived as stated and the work was carried out swiftly and very professionally with limited disruption. I am very pleased with the new boiler, and John took time to explain how the programmer works and even set it to my own requirements. I would recommend RJ Mitchell and Sons to anyone, and I will be using them to service my new boiler on an annual basis. 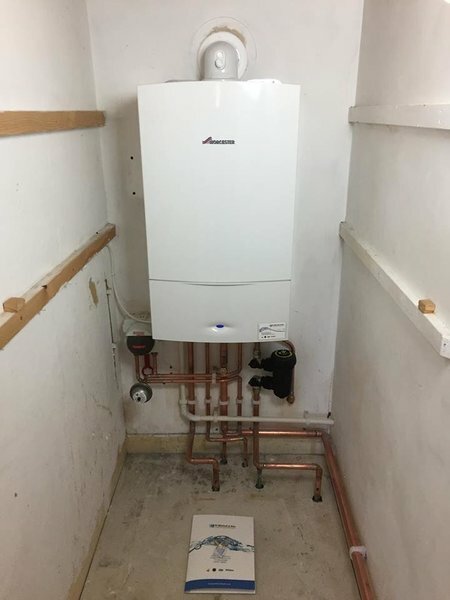 A replacement boiler was supplied and installed. The work was completed on the promised date. The work was executed tidily, and throughout, the process from initial visit to completion, was professional and courteous. I can’t praise R J Mitchell and Son highly enough. Very caring, very punctual and always answered my emails quickly. They fitted our new shower expertly. I would definitely recommend them and would use them again for all my plumbing work. Ten out of ten! 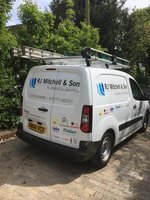 R J Mitchell & Son Ltd replaced a boiler and radiators for me. They are clearly very experienced and provided an excellent service in every respect. I initially requested quotations for a gas boiler replacement from three companies. Jon Mitchell impressed me with his knowledge and politeness in all respects. A fair price with no hidden extras and truly professional installation. Excellent service. Mitchells have been servicing my old boiler for ages, I was pleased that their quote for a new one was competitive. The new system was installed on the date agreed with no problems. A friendly, professional and efficient service as usual. Having serviced my gas boiler (central heating and hot water) for over 10 years, replaced the system when the old combi boiler failed. Good and thorough quote - explained what had to be done and why. Brought forward original date for work; good communication while waiting. Arrived on time on agreed date and worked efficiently and effectively throughout. Identified minor additional repair work and incorporated this. Explained what was being done and why throughout the installation. Good and thorough walk through boiler controls when installation complete. Work completed on time and to cost. Gave complete confidence that the work was done to a high standard. Very satisfied. Look no further. These are the best! 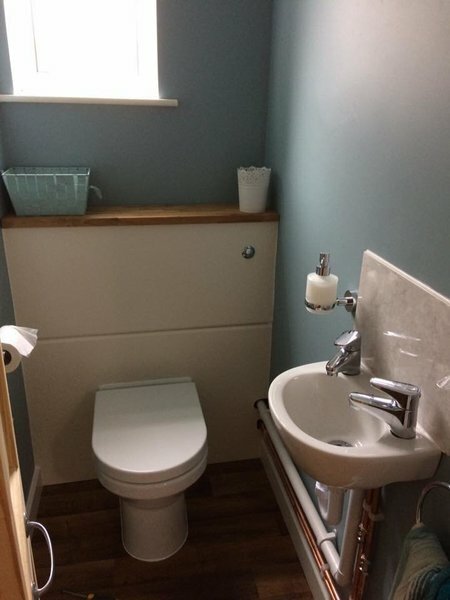 Complete refurbishment of a bathroom and making a cloakroom out of a cupboard. New boiler which had to be installed in a grade 2 listed building. John and his team were totally professional and trustworthy. Nothing was too much trouble. John's wife was also brilliant in keeping in touch and keeping us informed of timing and costs. Very good value and they work to the highest standards. Cherry and friendly and reliable at all times. Didn't show even a hint of impatience to our very exacting standards. Only problem you might have is quick availability. They are the best in the business, very competitive and so super popular. Plan ahead. Thank You John, Adam, J J and team. We are thrilled with all the work! Thank you Angie and Bill for your kind comments. The most recent work done for me by R.J.Mitchell and son was a service on my boiler. 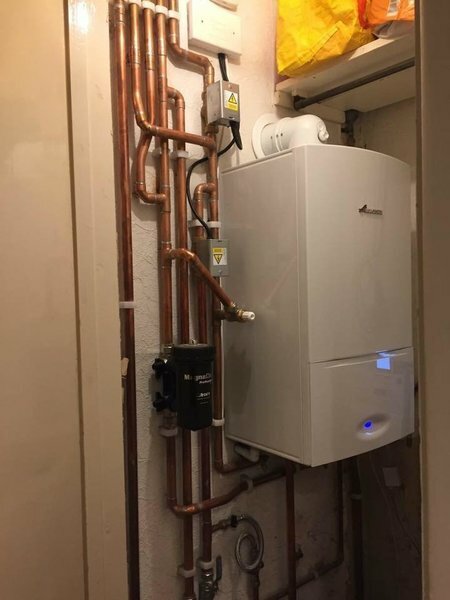 I have been using R.J Mitchell and son for plumbing and heating work for 10 years now, since they installed a complete central heating system for me, including 22 radiators, a new boiler, and huge amounts of copper piping. I have always been happy with the quality of their work, and the trustworthiness of their staff.